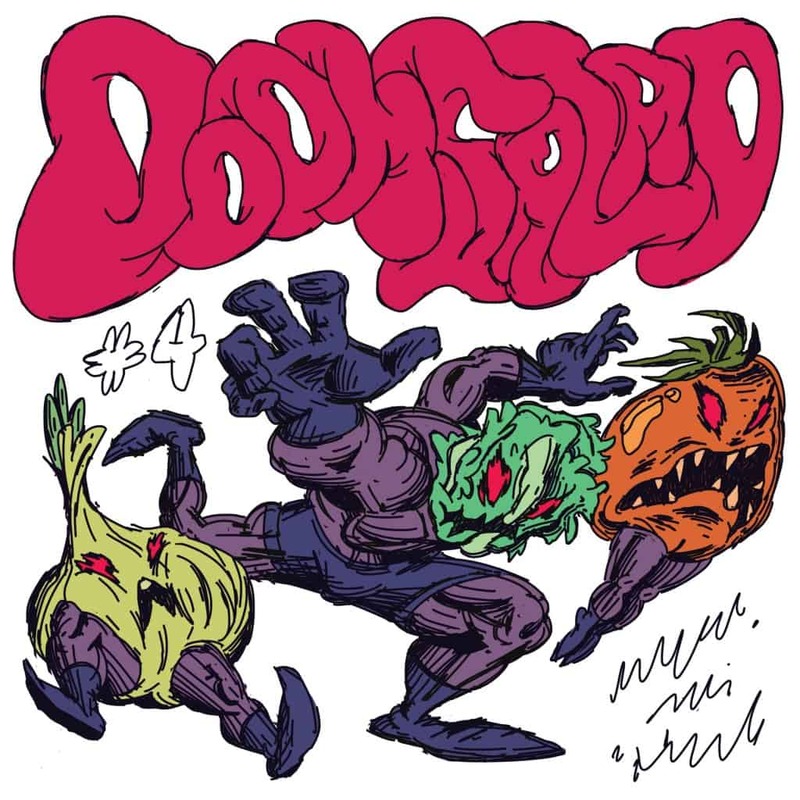 I’ve been a fan of Doom Salad for about a year or two now, just listening to their mind-bending experimental math rock compositions gave blisters to my fingers and cramps in my hands. However, instead of meticulously written and thoroughly thought about pieces, their newest EP, Sunscreens and Aerosols is four improvised tracks with titles drawn from a Twitter non sequitur spam account. The songs stem from five recorded improvised tracks that were edited to keep the best parts and leave the bad ones, what resulted is fifteen minutes of music split into four distinct parts. The proficiency of the musicians is really showing here, since they hardly feel like improvised songs at all, except for the many solo sections, especially on the keyboard, but that’s to be expected from any band influenced by jazz and incorporating improvisation in their song structure; Exivious did that with exquisite taste… without the synths. The variety of effects used on the guitar often blurs the line between that instrument and the keyboard, and it’s not uncommon to wonder whether it’s a guitar playing or not, until the other instrument comes and plays on top. It also alternates between noisy distortion and clean tones that sound more guitar-like. The keyboard’s sound is mostly some sort of electric piano, with a low fuzzy sound trying to mimic the bass on an independent hand. The first track, “Wild Don’t Diet, and Neither Should You”, demonstrates the more electronic guitar distortion and the frame of mind you need to get into in order to completely enjoy this musical experiment. It has some surprises, as you would expect an improvised piece to be somewhat straightforward, or at best cyclic in its use of time signatures, but some rhythmic saccades are really impromptu. Moreover, the song evolves continuously, without ever looking back and repeating parts of itself. Moving on to “Smell Irresistible and Save Yourself / Praline Christmas Mud”, the song is introduced by clean and almost oriental-sounding piano, later joined by clean guitar and soft drums. I haven’t quite yet grasped the pattern the guitar is playing, but it’s always resolving harmoniously with the rest of the band. Once again, I’d like to highlight the aptitudes of the musicians. This could be very well sold as a written piece. “The Real Goal of Any Talk or Speech” brings in some very nice reverberative, ethereal piano chords with high-pitched noises almost reminiscent of a theremin, accompanied by some guitar soloing and a relaxed drums beat. This slowly morphs into a more aggressive and oppressive part before taking a step back and letting some space for the keyboard guy to lay down some whacky sounds. Finally, the spotlight moves back and forth between the two. I really like this solo-exchanging song, they know when to start and when to let the other speak, another sign of great musicianship. The last song, “That Actually Work! or, an Introduction to Floating”, is the shortest one and my least favourite too. It’s a bit more atmospheric, and, after the strength of the three first songs, feels a bit weak. Maybe it’s because that, contrary to the previous song, the guitar and the keyboard are both going wild at the same time; instead of working together, they cancel each other out. In the end, Doom Salad’s rehearsals must be something incredibly interesting to listen to. If they live-streamed them, I’d definitely watch that! Sunscreens and Aerosols is a really good and weird EP. It sounds almost more like experimental jazz than math rock at this point, but the two worlds seem to coalesce into some sort of “math jazz” identity, which is how I’d describe this album, probably. I really enjoy the unchained musicality that’s really a consequence of the recording process here, being all improvisation. I’d prefer if the trio grew to include a competent and like-minded bass player into the band instead of relying on an ingenuine synth. Maybe those are hard to come by, but it’d bring the band up a notch (still). As a final word, this EP was unexpected and surprising, and very interesting despite its flaws. I recommend you check it out, it’s available for free on bandcamp, but you can donate a few bucks if you’d like to support the band, they deserve it.